As a way to further embrace this year’s theme of “Rooted in the Radical” JVC Northwest gave each community a copy of the book Making It: Radical Home Ec for a Post-Consumer World by Kelly Coyne and Erik Kutzen. The book is an adventure in simple living, filled with projects that range from homemade condiments to building a chicken coop – all geared towards the joy of making things by hand – and laughing at the inevitable mishaps along the way. 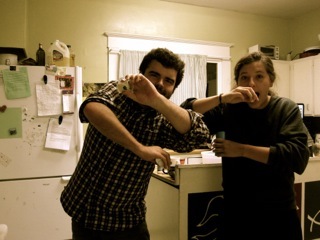 Yakima JVs, James Harper and Anna Green, show the fruits of their labor: putting on homemade deodorant! Led by Anna Green and James Harper, the Yakima JV community has jumped into exploring the value of simple living with gusto. So far, the community has experimented with several recipes from Making It, concocting their own mustard, honey/vinegar drinks, hair gel, deodorant, chapstick, spicy pepper spread, sauerkraut, and face wash. Anna explained, “Even though the mustard was too spicy, the hair gel a bit too egg-like, and the deodorant is not perfect, we are still determined to do 50 projects from the book this year!” While visiting Yakima on my area visit, I sampled some Sekanjabin, a traditional Iranian vinegar beverage with a hint of mint and ginger – it was delicious! Anna shared, “These projects are tangible examples of how living simply may take a bit more time, a bit more creativity, and ultimately, a redefinition of how some things ought to be.” To the Yakima JVs and any community experimenting with Making It – keep up the great work!